Thank you, Red Bull Music Academy, for sponsoring this post. Undoubtedly one of the greatest music experiences of the year, Red Bull Music Academy is returning to NYC for the third consecutive year. This month-long New York festival represents the ongoing legacy of the world-traveling Red Bull Music Academy that set up shop in NYC in 2013. The program and line ups explore and celebrate the city’s rich cultural heritage while spotlighting the modern music landscape. 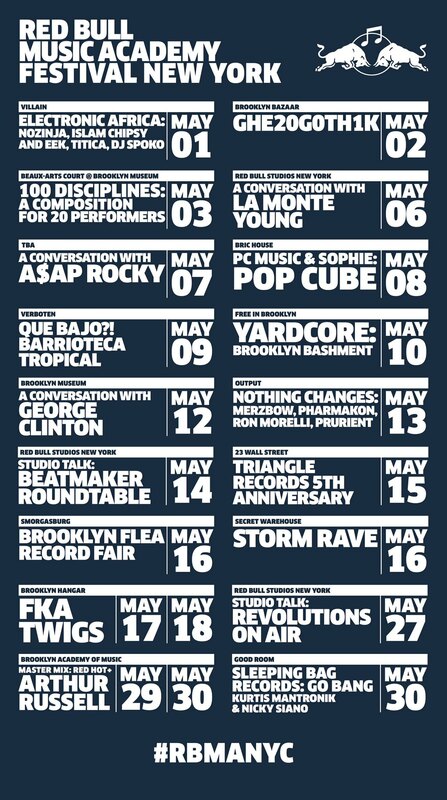 The festival will put on a multifaceted program throughout the month of May, presenting live performances, club nights, lectures and workshops at some of the city’s most stunning venues, featuring local innovators, international trailblazers and long-standing members of the Red Bull Music Academy family. And you, dear Bushwick Daily friends, now have a chance to win tickets to three big shows in May! As one of NYC's most influential and style-defining parties of the last decade, the GHE20GOTH1K name rings out way beyond the five boroughs. Founded by Venus X in 2009, the night was at the epicenter of a New York subculture that would leave its mark on the worlds of music, fashion, art, tech and design. Hood By Air, DIS Magazine, Fade To Mind and UNO NYC are just a few of the more prominent collectives whose members found a common meeting ground in the dark, hybrid, dynamic and cyber-obsessed space provided by GHE20GOTH1K. Red Bull Music Academy is excited to join forces with Venus X as she revives her party at Brooklyn Bazaar, headlined by New Orleans bounce pioneer. Since 2008, Que Bajo?! has been carrying the torch for upfront tropical sounds in New York City, as co-founders and resident DJs Uproot Andy and Geko Jones routinely power their dancefloor with a hip-shaking mix of cumbia, reggaeton, salsa, bachata, dancehall, baile funk, merengue, mambo, kuduro, kwaito, funana, tribal guarachero, and other styles too numerous to list. For this special edition, Andy and Geko will be joined by an all-star line-up that includes Puerto Rican reggaeton pioneer DJ Playero, Miami Latin bass king DJ Laz, Mexico’s Erick Rincon from 3BallMTY, Happy Colors, Pablitomix, Notch, and more. It feels like FKA twigs’ rise from experimental mystery woman to a genuine star pushing the boundaries of pop music happened so quickly that we still haven’t caught up. Now, over the course of two nights, the singer/dancer/producer/choreographer/director will perform two very special shows at the Brooklyn Hangar. The exciting next step in her evolution, she's been given complete freedom to bring her radical vision to the stage.